Missing Pieces is an independent film, one which has painstakingly made it through countless reshoots, rewrites and sleepless nights. Kenton Bartlett, a young film-maker at the heart of Missing Pieces, would be the first to admit the production was a serious learning curve - one with its highs and lows. 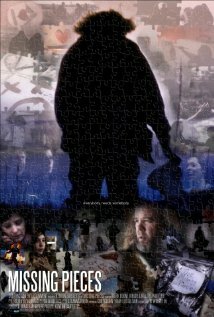 The end result is an indie drama, mystery and romance with a jigsaw narrative, similar to Memento, and a haunting atmosphere comparable to Never Let Me Go. While not in the same league as the aforementioned movies, Missing Pieces is not far behind. The concept of a puzzle narrative is ambitious for just about any film, yet somehow the lilting back-and-forth sway of time mimics its lead's head space and gives viewers a chance to put the pieces together themselves - making the process more engaging than your average Hollywood movie. Essentially, Missing Pieces is a character-driven drama contrasting two couples and each of their romantic relationships. David (Boone Junior) has suffered a head trauma after a car accident that has numbed him and distanced him from his partner, Delia (Walters). Plagued by the deteriorating relationship, he takes it upon himself to recreate love scenarios inspired by Delia's artwork - a bold, dangerous and carefully planned exercise involving the kidnapping of two lonely souls. The film has a haunting quality much like Never Let Me Go, where everything seems to have a just-out-of-reach reality. The beautiful, barren landscapes give Jonathan Arturo a chance to stretch his wings with the cinematography, which creates alien scenarios as if young Daylen (Hassel) and Maggie (Engel) have been abducted and stolen out of time. There's a similar tension and mood to some scenes in Eternal Sunshine of the Spotless Mind. The performances are solid. Mark Boone Junior establishes a lead character, whose numb disposition is no match for his yearning for love and acceptance. The portrayal has hints of Mickey Rourke, more specifically his blunt demeanor in The Wrestler. Melora Walters gives Delia a realistic cynicism with what little screen time she has, assisting the audience in cutting out a silhouette of David's former personality. Daniel Hassel and Taylor Engel have great chemistry, delivering the sort of debut performances you would expect from more seasoned actors. There's a natural quality and likability behind their characters and their interactions seem real - smoothing over any questions arising from their unique situations. Although, for a kidnap situation you'd expect more resistance and fear even. The score by Richey Rynkowski swathes the visuals in a haunting, melancholic yet hopeful beauty. The music gives the visuals greater emotional depth and also allows the jarring narrative to flow more easily from scene to scene. While additional music from Athletics gives Missing Pieces that underlying small town slice-of-life feel with an extra twist of quirkiness, although its poetic surreal quality would probably be enhanced by music from Billy Corgan. Missing Pieces is poetic. The emotionless narrator provides a sharp contrast with the real emotion at play. While she sounds like a text-to-speech generator, the voice adds another layer to the visuals. There's an artistic appreciation that runs throughout the film from its claustrophobic domestic scenes to the unreal wastelands. An equal dash of real and surreal, Missing Pieces channels creativity, emotion and heart. While flawed, it manages to transcend its limitations and leave the viewer with something original, thought-provoking and ultimately optimistic.